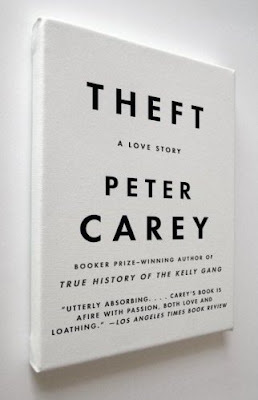 Interesting to note that the Kidd cover suggests theft through absence (there's obviously a painting missing) whereas the Gall cover uses the canvas to depict something that hasn't yet happened; it sort of reads more like "(There's going to be a) Theft." Or maybe this cold is getting the best of me and I should just lay down. Not as good as the hardcover, I'd say, although both are suggestive of the contemporary art market putting something over on the audience. One of the commenters on the earlier post wondered why the woman on the original cover was staring at the wall instead of calling the police. She's not really looking at the place where a painting used to be, but at an art installation called "Theft" that simulates a stolen canvas. Like the second cover, it's about hoaxing and hoodwinking more than outright thievery. I'm not sure how well that applies to this book in particular, but it certainly does to Carey's work as a whole--see My Life As a Fake. Hmmm. I get it, but it's sort of a floaty concept. what's being stolen and why and who and who cares. Is it about famous stolen art? Is it about a gallery? Is it about my paint tubes being stolen so that I can't paint and finally submit this as my painting to the gallery? What is it?